The trend of wearing a salwar suit is never out of fashion. This ensemble is not only absolutely comfortable, but is also apt for the uncertain weather conditions. Be it a formal event or a casual one, a salwar kameez will never let you down. Not only is this outfit hassle-free, it is also trendy & stylish these days due to the countless variations available. It is an on-the nail choice for most females for almost all occasions. With extensive variety of styles and patterns available it is also essential to check which one is perfect for you. Gone are days when dresses for womens only meant that one standard style. Several types of bottoms are available these days. The latest trends include jacket style kameez, angrakha dresses, anarkali suits, high-low, front slit, etc. Jacket style kameez is the most-latest trend in the Indian ethnic fashion world. It consists 2 layers—kameez and the jacket which adds a touch of novelty to the humdrum styles. You may enhance the look by opting out for contrast colour combinations on the kameez and the jacket. Go for Angrakha dress if you are looking to add oomph to your style. The tassels and overlapping layers give an exciting twist to the boring kurti pattern. This sophisticated yet humble ethnic outfit inspires all fashion lovers who think of buying something authentically Indian and brings out a wow appeal. Be it weddings, parties or festivals these give a rich look and are most comfortable to carry. High on style and low on complications anarkali suits are a must have for everyone who loves adorning ethnic outfits. The high-low styles begin with kurtis in particular, but this trend has been successfully adapted in dresses too. The high-low dress plays with the kameez length giving it a unique touch. Slits are not restricted to western clothing any longer. This trend has acquired a great position in ethnic fashion. If you wish to try something new and experiment bit go for front slit salwar suits as they are elegant to the core. 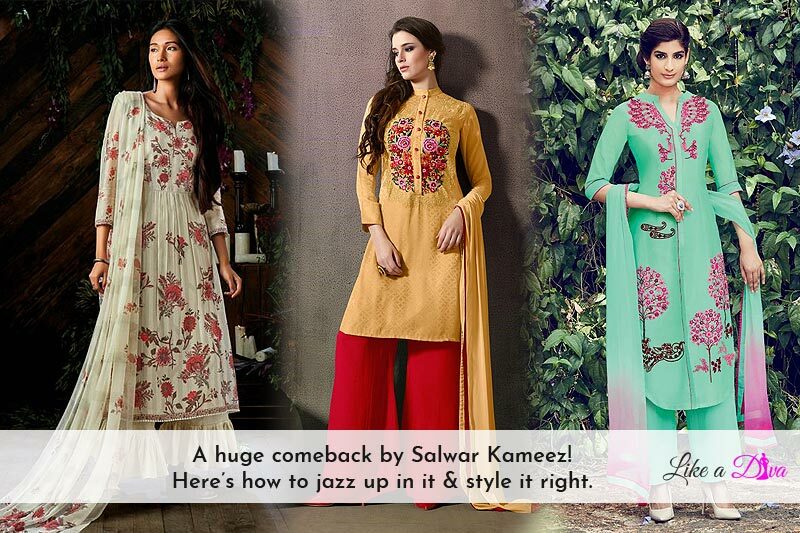 Along with the new designs and patterns in kameez, bottoms have also gone through a drastic transformation. Make way for fashionable patterns like parallel pants, palazzos, harems, dhoti salwar, etc. and bid good bye to the typical salwars. Straight-fit parallel bottoms are very much in trend. These give a look of formal pants and have no flares. Parallel pants are an amazing choice to up your style statement. Palazzos are a perfect choice if you wish to wear something breezy and trendy. Pair up your palazzo with straight fit kurti and girl you are all set to go! Somewhat similar to the typical salwar style, dhoti salwar is just like traditional dhotis. These have several pleats & are mostly ankle length. You’re definitely going to make a style statement by combining a dhoti salwar with a plain top. Harems are baggy with a slight fitted ankle. These can be work out with plain as well as heavy kameez. These bottoms are must-have for those who like loose clothes. Selecting a right dupatta with your salwar suit is very much important. These come in several different fabrics & patterns in order to look prim & proper. You need to invest in a right dupatta like Ikat, chanderi, Gota Patti or Kalamkari for that gorgeous and elegant look. Every fashion aficionado who likes wearing ethnic Indian dresses must invest in an Ikat dupatta. These come in bold prints and peppy colours that are perfect for almost every suit. Instead of matching out your dupatta with your suit, contrast it out. These days’ chanderis are very much in trend and are perfect to go with any salwar kameez. Pair up your pop hued chanderi dupatta with a simple dress & you’re bound to look stylish. These are laced or have delicate designs in gold and silver. These are also intricate with shimmery ribbons in tones of silver & gold. If you want an added essence to your outfit then definitely go for gota patti dupatta. Block printing, quirky designs and bold prints are the features of Kalamkari dupattas. These have bold dark colours and free-hand designs. Pair it up with a not so heavy salwar kameez & you are all set with a new look. There are several factors to consider before choosing a salwar kameez for any specific event. Here’re a few things you must take into consideration before finalizing your attire. Go for a heavily flared dark hued anarkali suit for an event in winter. Take care of the fabrics as well such as cotton is perfect for summers while opt for silk and georgette during winters. Party wear dresses must be worn keeping time of the day in mind. If the event is during day time it is advisable to opt for brighter tones or lighter shades. You can readily opt for darker hues like black, maroon, dark purple, dark blue, etc. for an evening party. Do not overboard your dress with too-many elements. For a small party go for a classy cotton salwar kameez, pair it with proper dupatta. For family-functions opt for a heavy front or side slit dress or anarkali suit.